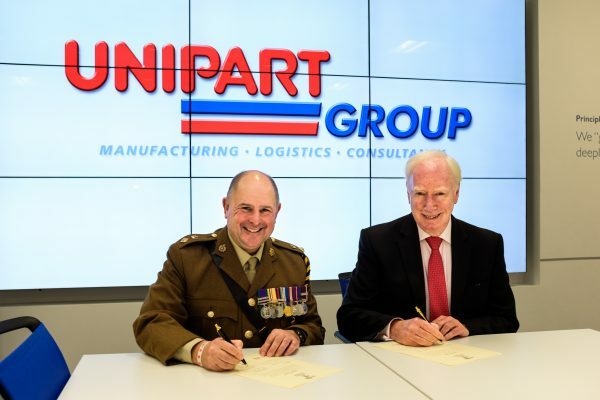 Unipart Group has signed a covenant with the Armed Forces aimed at recognising the value to the community and the country that comes from regular and reservist serving personnel, veterans and military families. Under the covenant, Unipart has committed to promoting the fact that we are an armed forces-friendly organisation; seeking to support the employment of veterans young and old. In particular, seeking to work with the Career Transition Partnership (CTP) to offer career mentoring support to service leavers. Earlier this month around 30 service personnel from Bicester Garrison attended a special course in the Unipart U to help them to transition to roles in industry. This was the second group from Bicester Garrison to take part in the training. The course, called Developing a Personal Marketing Plan, was originally designed for managers from companies in the Oxfordshire area who had been made redundant during the 2008 recession. JobCentrePlus turned to Unipart to create a course to help them find a way back into employment applying a set of marketing skills to the process of job hunting. The course has now been adapted for military personnel and contributes to the Army’s Individual Planning and Personal Development programme and is run under the Unipart Inspires programme. Under the covenant, Unipart will also endeavour to offer a degree of flexibility in granting leave for service spouses and partners before, during and after a partner’s deployment; and to support our employees who choose to be members of the Reserve forces, including by accommodating their training and deployment where possible. Lt. Col. Lyndon M Robinson RLC, Commanding Officer of Bicester Garrison signed the covenant with Unipart Chairman and Group Chief Executive John Neill at the company’s headquarters in Unipart House.